Digital transformation has to be a priority for small and medium-sized businesses. Economies of scale make it easy for large companies to outpace their smaller competitors, and the performance gap grows every year. Custom mobile application and tailored software supported by an insightful data science strategy can provide the edge needed to compete in the global marketplace. Mobile e-commerce is growing fast. Over 71% of online time in the US happens on mobile, and 62% of smartphone owners have used it to make an online purchase in the last six months. Businesses who have an effective mobile presence grow 40% faster than others. That’s why 98% of marketing experts recommend investing in a mobile-friendly website or app– yet only half of small businesses have one. These businesses are effectively leaving money on the table. Accessibility widens your potential customer base; even local businesses get more traffic when people can find them on the go. Establishing a mobile presence should be an early step in digital transformation. Megacorps usually have dedicated data science departments with proprietary software to process their data. That level of commitment isn’t necessary to turn data into insights, though. Many of the same services can be provided by a good development firm. Those that specialize in custom programming and business intelligence can create an analytics solution tailored to your company’s needs. For example, most modern enterprise software comes equipped with embedded analytics to translate their results. Instead of “reinventing the wheel” with from-scratch analytical programs, the developer can pull information from enterprise programs you already use and display it on a configurable dashboard. Dashboards are easily read by non-IT professionals, which cuts out the middleman between analysis and use. This is a good time to consult with your developer about your company’s current software subscriptions. Some may be redundant, or there may be more efficient solutions that can be used across the organization instead of within a single department. Big companies can absorb more loss when it comes to advertising; a weak campaign has more severe consequences for small business. That’s why it’s important to make every dollar count. Marketing is an area where data science makes a huge impact. Predictive analytics help determine the most effective markets for adspend, suggesting areas where the product is being well-received and those where the cost of customer acquisition is unreasonably high. 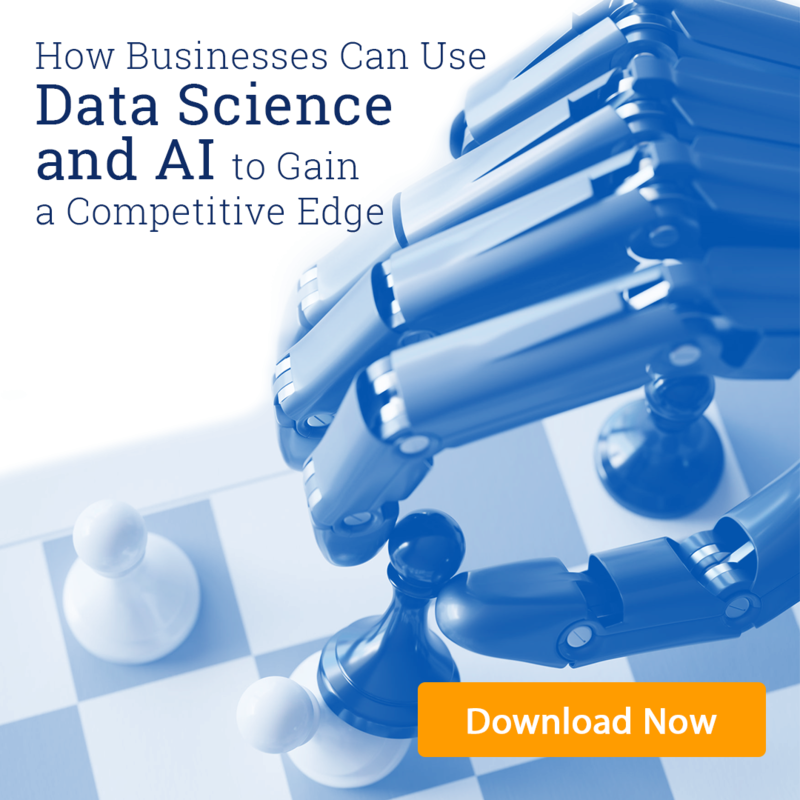 If you want to know how you can turn your company into a data-science-driven enterprise, download our new white paper: How Businesses Can Use Data Science and AI to Gain a Competitive Advantage. CMOs who employ AI-powered marketing report significant gains in customer retention, engagement, and lifetime loyalty. The benefit comes from a more personalized customer journey made possible by analyzing internal data (loyalty programs, site activity, CRM data) to build a portrait of the customers that is supportive of the mobile app or custom software system being used. This analysis is referred to as intelligent customer profiling, one of the latest applications of predictive analytics. It has widespread benefits. Knowing the customer leads to knowing what motivated them to choose a company and what might alienate them. Those with the highest ROI can also be targeted for special incentives and support. If you own a small or medium-sized business, now is the time to embrace data science. Digital transformation isn’t just helpful, it’s necessary. 47% of enterprise leaders believe the non-digital business model will be obsolete by 2020 and that companies who don’t embrace technology are going to be out-competed. Even large corporations who haven’t moved towards digitization have started dropping off the Fortune 500 list. Don’t get left in the digital dust. Put your data to work and you’ll put your company on track for a long, successful future. Getting started with digital transformation? Let Concepta guide you through the first steps. Contact us for an in-depth assessment of your needs.